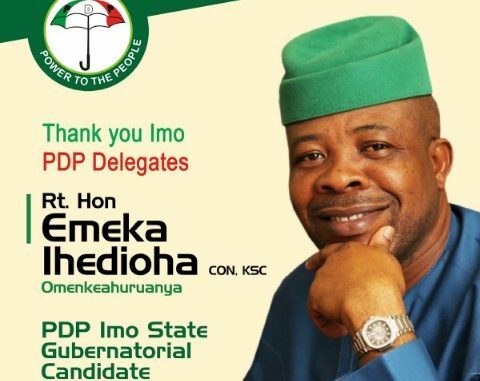 Former Deputy Speaker of the House of Representatives, Emeka Ihedioha, has emerged winner of the People’s Democratic Party (PDP) governorship primaries in Imo.Ihedioha won the contest with a total of 1,723 votes to defeat the Senator representing Imo East senatorial zone, Mr Samuel Anyanwu, who came 2nd with a total of 1,282 votes. “With the power vested on me as returning officer, I hereby declare Emeka Ihedioha the winner and flag bearer of the PDP in Imo for the 2019 governorship election, ” Nwala he said. 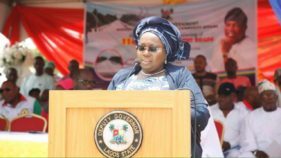 The News Agency of Nigeria (NAN) reports that the exercise which was originally scheduled to hold on Tuesday started at 4.00p.m on Monday and ended at 4.30a.m on Tuesday at the Kanu Nwankwo Sports Centre, Owerri. 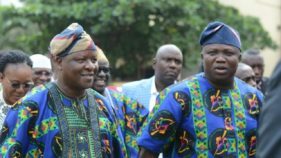 Other aspirants who participated in the process are former senator representing Okigwe senatorial zone, Mr Athan Achonu, who scored 63 votes, Prof. Jude Njoku, 21votes, Chukwuma Ekomaru (SAN), 7 votes and Mr Chukwuemeka Ezeji, 1 vote.